Updated: September 1st 2016 True! Black German Shepherds sometimes take people by surprise with their solid dark color coat. Commonly they are even mistaken as a mix breed or other dog breed. The Black German Shepherd has some distinct variations when compared to the standard German Shepherd. Their uniform appearance, high trainability, and stable temperament allow them to be excellent companions, family dogs and work as police dogs or as a disability aid for the handicap. Find out more about the GSD service dog training by clicking here. The black coat gene color can either be dominant or recessive. This means that there is a possibility that a German Shepherd that is not all black can hold the gene and produce solid black German Shepherd pups. 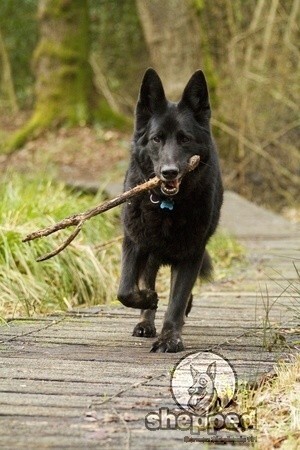 If you are interested in breeding your Black GSD, you should inquire about your dog’s ancestry and blood line. A German Shepherd’s coat color can be determined as early as seven to eight weeks old. The Black German Shepherd is known to exhibit the traditional look of the breed. They have a straighter back and are larger when compared to the standard German Shepherd. Their coat length can range from short to long and have the appearance of feathering, flowing or skirting. The Black German Shepherd is not usually aggressive. He may take the time to make friends with strangers, but once he does, he will be extremely kind. When he is with a family, he will be approachable and easy-going. Although Black German Shepherds make great guard dogs, they also need attention and time with their companion or family. This special trait is what makes them perfect candidates to work as service dogs for the blind, deaf and handicap. Have you ever been walking your Black German Shepherd outdoors only to have people cross the street to stay away from you both? The strong appearance of a Black GSD may scare off strangers, but as a dog owner, you should be aware of the breed’s temperament. In reality, Black German Shepherds have a pleasant temperament that is stable. They are loyal and watchful dogs that are willing to express their self-assurance by keeping a watch over their family. This means that if danger were to ever approach you or your family, your Black German Shepherd is known to protect you at all costs and rarely will back down against an enemy. Early socialization is important for your German Shepherd. It allows him to get used to a variety of different people, experiences, sounds, smells, and places. It will also teach him how to behave in each situation, and he will carry this behavior throughout his lifetime. As soon as you bring your pup home, it is recommended that you introduce him to family and friends that will frequently be visiting your home. Also, you will want to take him on walks around the neighborhood so he can get to know the other dogs in the area. If you have a dog park located close-by that you plan to take him to, introduce him slowly by allowing him to first watch the other dogs and then on the next visit give him the freedom to play with the other dogs. If you have adopted an older Black German Shepherd, it is wise to socialize him slowly. Chances are he might have had a negative experience with people as well as other dogs. Introduce your family first and then invite guests over one by one. 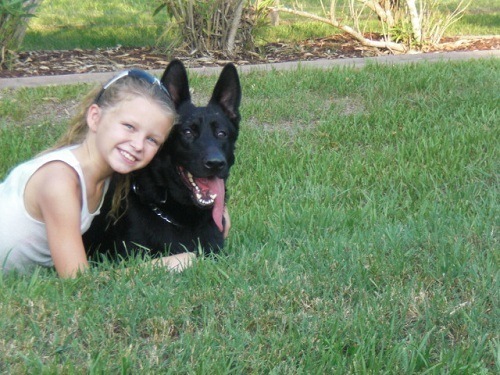 Black German Shepherds are extremely good with children. Allow your pup to have plenty of exposure to your children under your supervision when they first meet. 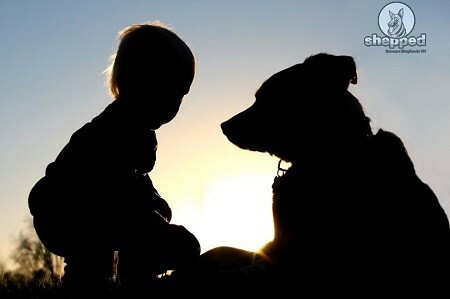 Once they bond you will find that your GSD will become your children’s best friend, playmate, babysitter, and protector. Although German Shepherds are usually gentle around children, he may bump into your toddler or young children by mistake or wag his tail with happiness and accidentally tap your children, however, this is rare. 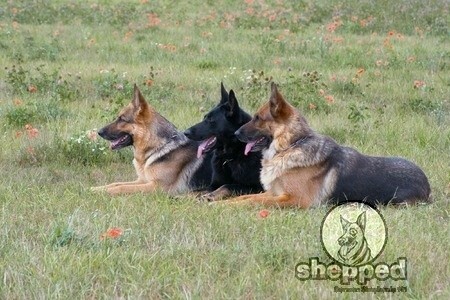 Black German Shepherds also have the ability to get along with other pets in the house including cats and other dogs. But they need to be introduced to them slowly and usually during puppyhood. Owners of Black German Shepherds will be delighted to know that raising a healthy pup is easy. One of the first things you will want to do is bring your pup to the veterinarian for a check-up and discussing any health issues that need to be addressed. You will always want to keep vaccinations current. 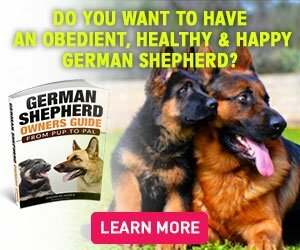 Providing your German Shepherd with a healthy diet is essential to his health. It is best to choose a dog food brand that includes healthy, natural ingredients and offers the food in dry and wet forms. Your Black German Shepherds teeth need to be used, and it is wise to provide dry food for him to crunch and exercise his gums. Since GSDs need daily exercise, they are usually prone to getting a bit dirty. Make sure you groom and clean your dog on a regular basis. Grooming should include bathing, nail cutting, ear cleaning, and teeth cleaning. While Black German Shepherds are known to have a 12 to 15-year life expectancy a health issue is popular within the breed, but not life threatening. Hip and Elbow Dysplasia is a common health concern for dog owners. Symptoms of hip dysplasia can range from mild to severe. If you notice your Black German Shepherd exhibiting symptoms such as limping, stiffness or soreness in his hips or hind legs you will want to contact the veterinarian immediately. After a thorough examination that includes radiographs, physical examination and manual tests on your dog’s hips, the veterinarian will either confirm or deny the presence of hip dysplasia in your dog. If your dog is diagnosed with hip dysplasia, don’t panic. Most of the time hip dysplasia is hereditary, and there is nothing that you as a dog owner could have done to prevent it. The veterinarian will advise you of how to care for your Black German Shepherd, which could include a change in diet, massage, joint supplements, prescription pain-reliever, surgical options, hip replacement and maintaining a healthy weight. If you don’t already have this breed as a pet, have you fallen in love with them yet? What more can you ask for when one amazing dog can provide you with companionship, security, loyalty and the capability of getting along well with children and other pets in your household. If you have already brought your pup home or you, plan to soon, make sure you are providing a healthy environment that is suitable to his needs. This includes a comfortable, supportive bed, plenty of chew toys, room to exercise outdoors, food and water bowls and space to call his own. You will want to designate an area that can be blocked off with a baby gate or a large crate that he can seek refuge and relaxation in any time he needs. Black German Shepherds can be comfortable living outdoors or indoors as long as you provide balance into his daily schedule. This means you can’t leave your dog outdoors or indoors alone for long periods of time. Your dog needs attention from his owner and family. If you plan to house your dog outdoors, you will need to provide a safe house for him. You can either purchase a dog house or build one yourself. It is wise to provide a doghouse that is large enough for an adult sized Black German Shepherd to stand up in and turn around easily. Weather conditions can cause dirt to go inside the dog house; it is essential that it remains clean at all times. You wouldn’t want your dog to sleep in dirt or wet conditions; this can cause skin problems if exposure to dirt and harsh conditions is consistent. If you live in an apartment and insist on bringing a Black German Shepherd into your family, you should remember that you need to provide daily exercise. Make sure there is a park, open land or plenty of space outdoors where you can walk with your dog and allow him to play. Placing your dog in a doggy daycare while you are at work is also a great way to exercise your dog. Now that you are familiar with the genetics, characteristics, temperament, health needs, care needs, grooming needs and physical needs of a Black GSD it should help you to either take care of the pup you already have or welcome a Black German Shepherd home to join your family.